So stop coding that fancy webapp now and go sign that petition! This entry was posted in Internet, lang:en, Politiek, Web development and tagged petition, stop software patents on 26 January 2009 by frank. When blogging, tags and/or categories allow you to classify your posts. The taxonomy you create that way, allows searchbots (and human readers) to better understand what the post is about and to find related posts. Ever since the release of WordPress 2.3 (in sept. 2007), you can specify both categories and tags for your posts. More or less following the ideas put forward by Lorelle-on-WordPress, I use categories as the main classification-method (putting posts in a hierarchical, directory-like structure) and add one-off keywords as tags. The only disadvantage: as tags are one-offs, the default tagcloud-widget in WordPress generates a dense put useless heatmap. If you’re in the same situation, you might benefit from this little WordPress-plugin I wrote (well, …copy/pasted, actually, 80% is code straight from the original WP-tagcloud widget) to solve my tagcloud-woes. 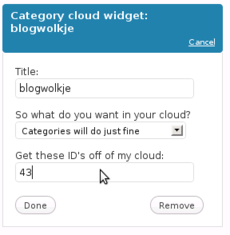 Once unzipped in your plugins-folder, “category cloud” will provide you with a widget which can not only generate a “tagcloud” or a “catcloud”, but also a “cat-and-tagcloud”. And because the default “general”-category might skew your catcloud-results or because you might prefer to have that NSFW-tag not show up, you can exclude tags and categories from being shown as well by entering their ID in the appropriate input box. This entry was posted in blog, Internet, lang:en, wordpress and tagged categories, plugin, tags, widget on 23 January 2009 by frank. De mannen van De Jeugd van Tegenwoordig zijn bij Volt op Stubru wat plaatjes van een handvol favorieten en vriendjes komen mixen. Arjuna Schiks is zo een vriendje en die zijn Afterbelle is écht wel vet! Now can someone hit that play-button already? This entry was posted in Muziek and tagged Arjuna Schiks, dansplaatjes on 21 January 2009 by frank. A few weeks ago my wife complained she couldn’t install software on her WindowsXP-laptop any more. When doubleclicking the downloaded application, she got the errormessage “This is not a valid win32 application”. After having frantically searched for “Security Zones” in FF own configuration-screens, I turned to Google only to find out that this setting is actually managed in the MSIE configuration UI. 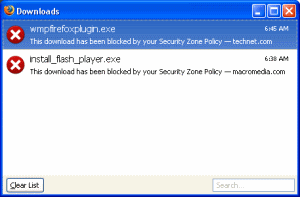 So to enable Firefox to download executables, I have to change MSIE-configuration (which I did)? Weird to say the least. 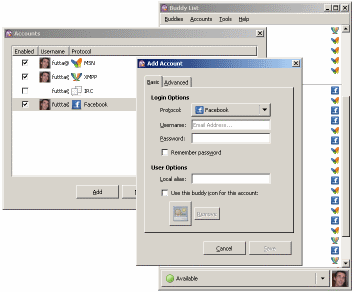 This entry was posted in browsers, firefox, lang:en and tagged windows on 20 January 2009 by frank. Dus Caroline Gennez en den Baard voerden de “Partij” in sp.a af om een handvol “Progressieven” binnen te halen en zijn nu verwonderd dat de partij tegenspartelt? Misschien hebben ze soortgelijke plannen met de “a” in de naam; een handvol ACW”ers, oud-Agalevers en andere Alternatievelingen staan ongetwijfeld te drummen om ook een letter te krijgen. de verkiezingen in 2007 en in de opiniepeilingen? Mag ik daarom een tegenvoorstel doen? Laat die gedemodeerde “a” terug vallen en voer als SP (“Socialistische Partij” of “Socialistisch Progressieven” als U dat echt wilt, zolang het maar “Socialistisch” is) keihard oppositie tegen de sociaal-economische politiek van deze regering. Als Johan, Caroline en Bert zich daar niet in kunnen vinden, mogen ze gerust een stapje terugzetten. Dan mag één of andere oude bulldog wat mij betreft gerust nog even uit zijn kot komen. This entry was posted in howto, lang:en, Politiek, Quickie, rants & raves, Technology and tagged gennez, sp-a on 16 January 2009 by frank. Fleet Foxes live, dank U Klara! Gisterenavond op Klara in Live Unlimited naar een live-opname van Fleet Foxes in de AB geluisterd. En ge hoort me al afkomen; mooi dat dat was! This entry was posted in followup, Muziek and tagged fleet foxes, klara on 10 January 2009 by frank. If you’re using Facebook, you’ve probably already tried out its chat functionality. Yet another browser-based chat, only available when on Facebook, right? Except there’s this great plugin for the open source, cross-platform, multi-protocol IM-client that is Pidgin. Just add Pidgin-facebookchat to your plugins and you can chat with Facebook-friends the same way you chat with all your Google Talk-, MSN- or AIM-buddies. Nice work guys! And for the Twitter-loving Pidgin-users; maybe this Twitter-plugin works for you? This entry was posted in e-life, Internet, lang:en and tagged chat, facebook, pidgin on 9 January 2009 by frank.